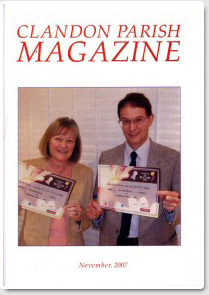 The East and West Clandon Parish Magazine is published 10 months of the year. Tim Anderson (West Clandon) is the Editor. If you have magazine content you would like published contact Tim on 211481 or email clandonmag@gmail.com. The latest editorial date is normally 15th of the month and the magazine distribution process usually starts around the 1st of the month. The Distribution Manager for both villages is Willemien Downes (222461). The East Clandon Village Distributor is Felicity Jaffe (222890) who in turns distributes to 8 area distributors.